Pravassa founder Linden Schaffer sat down with Inspired Conversation's Amy Schuber for a conversation on all things wellness travel. In the podcast episode, Linden discusses how she turned her passion for wellness travel into a career, and explains how she pivoted from a job in the fashion industry to launching her own business. Linden also shares some of her own wellness travel tips, such as a pre-packing her staple items and the benefits of fasting in-flight. Click here to access the Inspired Conversations podcast, where you can listen to Linden's journey firsthand and learn more about the Pravassa travel experience. Our founder, Linden Schaffer, may spend most of her year outside of the country, but she still has a love for wellness when she's home. Check her some of her favorite US spots that allow anyone to add wellness to their routine. Want to plan a custom wellness vacation to India? Tell us more! Article was written for and originally appeared on MindBodyGreen. Almost one year ago on a scouting trip to Vietnam I ended up in a White Thai village on the outskirts of an area called Mai Hich. Walking around the empty streets it was quiet and peaceful – birds singing, laughter in the distance. I asked my guide a question about one of the houses and not knowing the answer he looked around for a local to ask. I’m writing to you from the jungle of Vietnam. Today I met Minh Chung, a 19-year-old White Thai Villager who is studying English on his own from a journal where he writes down every new word he learns. His hope is to pass his university entrance exam and win a free scholarship to school to study to be a tour guide. This is just one example of the many #changedbytravel experiences I am lucky enough to have every time I travel. It reminds me there is hope and the desire to better ourselves all around the world no matter your current situation. What this email did not convey was the depths of my compassion and empathy for Minh Chung. I literally called my husband to discuss the possibility of sponsoring Minh Chung and sending him to University. As thoughts of helping him continued to swirl in my head, I struggled to find a sustainable solution that would further Minh Chung’s education without taking him away from his single mother, who desperately needed him around for her care and to contribute to their household. Last week, Pravassa and our Vietnam group of travelers were lucky enough to return to this White Thai village and meet Minh Chung. What I had decided to do was ask our wellness travelers to bring university to him, by building a library to help him further his studies. 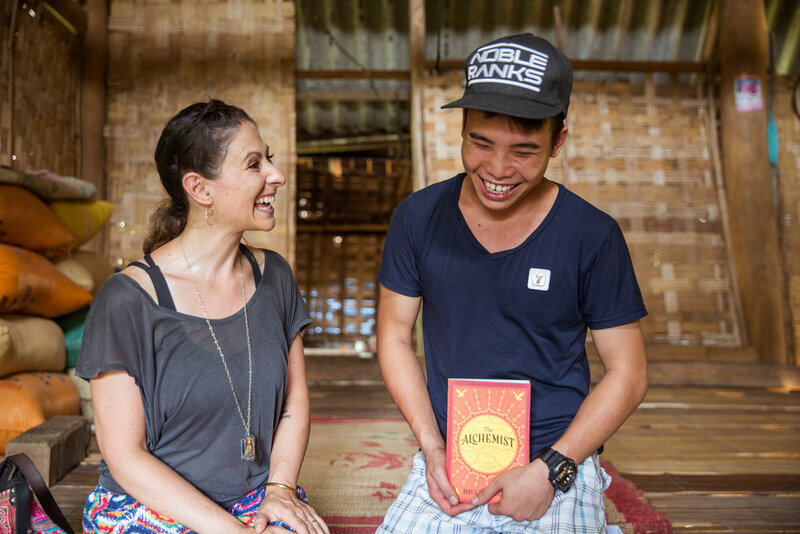 Thirteen people from the U.S. (and Costa Rica) traveled thousands of miles with their favorite English language travel novel and shared how important these books were to them. Sitting in Minh Chung’s house being served tea in borrowed cups from the neighbors and sharing our collective knowledge was an indescribable moment. At a loss for words, Minh Chung wouldn’t stop smiling and saying thank-you, telling us how words were failing him at that moment. Looking to have a #changedbytravel moment of your own? Pravassa curates both group and custom wellness travel opportunities around the world. Just tell us where you want to get started. We Know You're a Super Hero. Ever thought about traveling with Pravassa, but weren't sure what to expect? Self-care takes center stage. Thank you Organic Spa Magazine for shedding some light on our wellness travel philosophy. Stressed out? Eating badly? Sleeping with your phone rather than your partner? Great news, one small change can put on the path to wellness.